We have just completed our new flyer. It’s had a complete overhaul and has a fresh clean design. We are asked often by our users if we have any promotional materials for special events or for display in the libraries at point of use. 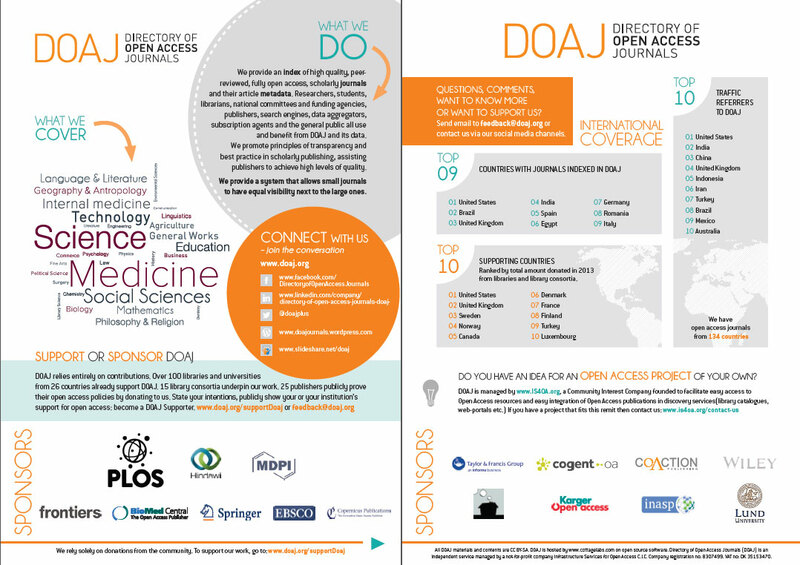 For the first time, we now have a high-res print version of the flyer for you to print as and when you need. We’ve added data on the top countries that refer the most traffic to DOAJ and the 6 different ways that you can connect with us, as well as our four new sponsors: PLoS, Cottage Labs, Wiley and Karger. If you would like more information on our promotional materials, if you have an event that you would like material for, or if you would like to see your name on our flyer, please contact me by leaving a comment here. The flyer was designed by Karin at K-Art.se.